A predominantly rock peak with plenty of scope for new variations, especially on its south-west face. 500m of climbing consisting of four rock buttresses with linking snow ridges. The lower buttress is comprised of good rock, the second is steep rotten rock, and the remainder good rock. Austin Brookes, Bruce Farmer, Ralph Miller, Jan 1978. Ascend the face right of the North East Rib via an ice gully with a rock crux (15/16) at 2/3 height. The top section is on generally poor rock. Bill Atkinson, Rob Hall, Nov 1981. A face route that starts between the Atkinson-Hall and North Spur routes. From the bottom move gradually left until the North Spur route is visible, move right over chossy ground then straight up to join the North Spur route, climbing 20m of superb exposed slab. This route meets the North Spur route where it flattens then continues to the summit. Good red rock provides cruxes of 16/17 and allows good pro. Carol Nash, Greg Aimer, Jan 1986. Ascend the rib to the right of the Couloir Route to gain the ridge proper, ascend to a prominent gendarme, which can be turned on the north or traversed, and then up the face, where the North Spur joins the ridge, to the summit. H Bohny, T Sidler, Jan 1955. Amongst the ramparts of Mt Haast, a stellar 60m pinnacle. Good pro small to med wires & cams. 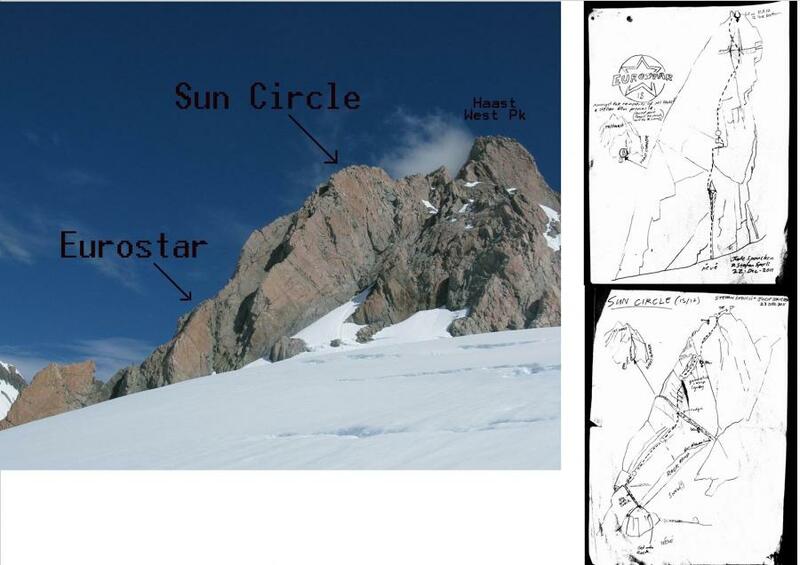 Starts at Haast corner and finishes on the west ridge.